An experience like none other, this epic Galapagos Islands land and sea adventure will have you snorkeling with turtles, summiting Cerro Mesa, and more. 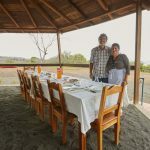 Instead of exploring the Galapagos Islands exclusively via land or sea, Knowmad travelers Rion and Shelly’s trip is an example of incorporating both a land-based accommodation and a catamaran cruise. The two enjoyed hiking, spotting wildlife, relaxing on their Galapagos Safari Camp porch, and experiencing life at sea onboard the Anahi. Thanks for the kind words, Rion. Learn about this unique Galapagos Islands trip below. Knowmad specializes in creating unique, custom trips to the Galapagos Islands and mainland Ecuador, as well as greater South America. If this Galapagos Islands travel experience isn’t exactly what you’re looking for, email us at travel@knowmadadventures.com or give us a call at 612-315-2894 and we can help you craft the adventure of your dreams. You will be met in your hotel lobby and transferred to the airport to check in for your 7:05 a.m. flight to the Baltra Airport in Galapagos. The flight from Quito to the Galapagos is approximately 2 ½ hours on a Boeing 727. Upon arrival at Baltra travelers pass through an airport inspection point to insure that no foreign plants or animals are introduced to the islands. Your park entrance fee of $100 and $20 for the INGALA card, which is an identity card that you need, will have been pre-paid. A representative from Galapagos Safari Camp will meet you and take you to your accommodations. Today you will visit the highlands of Santa Cruz and the tortoise reserve where you will see your first giant Galapagos Tortoise. Arrive to your luxury safari style accommodations for a relaxing evening. Today you will visit the eastern side of Santa Cruz, the Cerro Mesa and Garrapatero for trekking, biking and kayaking options. At 490 meters above sea level, Cerro Mesa offers spectacular views and boasts the larges crater on Santa Cruz. This will all be on a private basis with guide so you can decide how active you would like to be and do more or less activities or simply soak in the sun and relax on the white sand beach. Enjoy the sunshine and wildlife as you have a delicious picnic on the beach. After lunch you can visit Garrapatero Beach, where the contrast of mangroves, black lava, white sand and turquoise water, along with its birdlife and flamingo lagoon, is magnificent. Today you will visit North Seymour (or a similar island not visited in cruise itinerary) to snorkel with a wide array of sea life and begin to discover the variety of wildlife found on these islands. The Galapagos Marine Reserve is the second largest marine reserve in the world, and snorkeling off the boat is a highlight. Today you will be taken to your cruise to begin the cruise portion of your Galapagos adventure. Motorized rafts, called ‘Pangas’ will transport you to the M/C ANAHI and our crew will welcome you onboard. After departure and lunch, the first island visit is made. This bay has its origin when the crater of this island collapsed below sea level. The wet landing is on a beautiful white coral sandy beach. This is a favorite island for birdwatchers: red footed-booby, masked boobies, wandering tattlers, lava gulls, whimbrels, yellow-crowned, and black-crowned lava herons, and yellow warblers can be seen in the area. Continuing on the trail, visitors climb gradually to the edge of the cliff seeing Red-Foots nesting in the Mangrove trees below. Bird watching includes sightings of sharp-beaked finches, large cactus and ground finches, Galapagos doves, and swallow-tailed gulls. Reaching the end the trail at the cliff’s edge offers an incredible view of the island and the many birds living there. Located in the southeastern part of the Galapagos, this island was formed from an uplift instead of a volcanic origin, making it mostly flat. There are some theories which assure this could be the oldest island in the Archipelago. Santa Fe is the home of a number of endemic species like the Galapagos hawk, Galapagos snake, Galapagos mockingbird, rice rats, and one of the two species of land Iguanas of the islands. After disembarking in the beautiful and clear waters you will be in contact with one of the many sea lion colonies. Along the trail many salt bushes can be seen as well giant Prickly pear cactus, gigantism is a characteristic of oceanic islands. There are great possibilities of snorkeling with playful sea lions and tropical fishes. This place is on the north side of San Cristobal. Here there are endemic species such as lava lizards and red-footed boobies. The view is impressive when you walk up to the high part of the island. You may be lucky to see the red-footed booby – the least seen of the bunch. It’s also the home of the Chatham mockingbird, only found here on San Cristobal Island. Also known as the Sleeping Lion because of its resemblance, it is located off the coast of San Cristobal. The remains of a lava cone eroded by the sea, the two vertical rocks rising 500 feet from the ocean form a small channel that is navigable by small boats. This Galapagos Islands natural monument has become a favorite sight for cruises due to the many tropical birds, frigates, and boobies that fill the surrounding air. Beneath the sea the nearly crystal waters offer a brilliant show of colorful tropical fish and invertebrates. Isla Lobos is about an hour by boat from Port Baquerizo Moreno. The trail is 850 meters long and the estimated travel time is one hour. There is a small population of blue-footed boobies and common frigate birds nesting on this site. You can observe the two species of sea lions present in the archipelago. During the tour you go through a dry vegetation zone, substrate of volcanic rocks and a sandy area. During the panga tour brown pelicans and several species of shorebirds can be observed; although, snorkeling, it’s common to see juvenile sea lions, manta rays and sea turtles. An Interpretation Center’s, lush gardens and sweeping ocean views are a strong contrast to the 1960’s style buildings at the Charles Darwin Center. Visitors to the Interpretation Center can learn about both the geological and human history of the islands, conservation issues, and natural history. The older Museum of Natural History attempts to preserve the natural history of the islands. It is called Tijeretas because this is the name commonly known for the frigates. It is located within walking distance of Port Baquerizo Moreno. The loop is 3.5 miles and estimated travel time is 2 hours. There are many vistas where you can appreciate the beautiful scenery and there is also an inlet where you can go snorkeling. It is one of the only places where you can watch the two species of frigate birds nesting in the same colony. After visiting this amazing place you will be taken to the airport for your return flight to the mainland. Upon your arrival in Quito you will be responsible for checking in for your overnight flight home. If you have any questions we can help answer, or if you’d like to discuss planning your own adventure to the Galapagos Islands, reach out to our Trip Specialists at 612-315-2894 or travel@knowmadadventures.com to begin planning your personalized Ecuador itinerary. Note: This post was edited and updated on June 13, 2017.